Lahore: February 2, 2010 – Mobilink, Pakistan’s market leader in cellular services and part of Orascom Telecom Holding has launched its 24 Ghanta Offer which allows customers to talk for 100 minutes in a day for only Rs 29. Mobilink Jazz, Pakistan’s favorite prepaid cellular brand, always strives to bring unique offers to address the needs of different prepaid customer segments. Continuing this tradition, the Jazz 24 Ghanta Offer connects more than 30 million Mobilink family members without the restriction of day and night. To avail the Mobilink Jazz 24 Ghanta offer, available for a limited period, customers can move to the new tariff plan by sending SMS to 676 which is subject to one time subscription charges. Once on the “Jazz 24 Ghanta” tariff plan, customers can subscribe to daily bundle to avail 100 minutes in Rs 29 on any given day by dialing 121 or dialing *101*1*05#. 4 Responses to "Mobilink Jazz Launches ‘24 Ghanta’ Offer"
I’m surprised why PTA is not taking any action against the so called leader of Pakistani telecom “Mobilink”. According to rules ‘Bait advertisement’ is an infringement of consumer rights and PTA is bound to monitor and halt such activities by any telecom company in Pakistan, to safeguard the interests of public. You might have gone through the Mobilink ad about 24 ghanta offer. The ad is highly misleading and falls in Bait category. 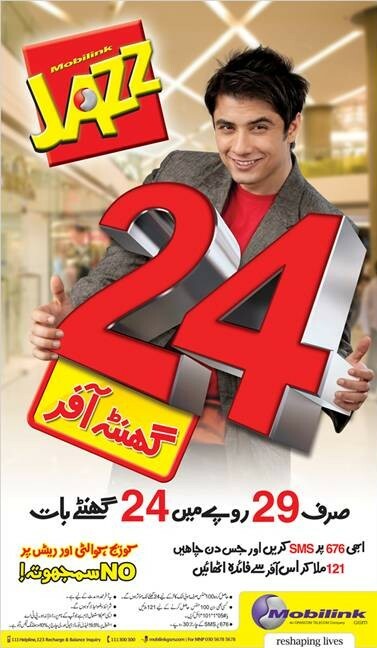 Through this ad Mobilink is hiding the real face of this ‘attractive’ offer. The ad depicts the offer as highly beneficial for the users but in reality it is a ‘corporate robbery’. Through this post I request to the PTA authorities and the CJP that they should take strict action against such violation of consumer rights. @Akif – Thank you for writing Akif. Would you please share how this ad is misleading? So, we can write an individual article on that.